Illuminated manuscript. Netherlands, 15th century. 351 leaves. Provenance: Abbey of Marienwater’s Hertogenbosch (Netherlands). — Frederik Muller (Amsterdam), 27–31 January 1860, lot 126. — William Bragge. — Bragge sale, Sotheby, 7 June 1876, lot 491. — Thomas Shadford Walker. — Walker sale, Sotheby, 23–24 June 1886, lot 345. — Morris. — Richard Bennett. — Sotheby 1898, lot 815 (sold to Henry Wellcome for £15). — Henry Wellcome. — Wellcome Library [deaccessioned]. — British Museum (purchased 1943). — British Library (Egerton 3271). References: Ellis valuation, fol. 5, no. 80 (£10). — Schoenberg (SDBM_MS_8108). Illustrated. With a bibliographical note by Cockerell. Provenance: William Horatio Crawford. — Crawford sale, Sotheby, 12 March 1891, lot 1556 (sold to Ellis for 14s.). — Morris. — Richard Bennett. — Sotheby 1898, lot 596 (sold to Quaritch for £35). — Quaritch. — British Museum (purchased from Quaritch, May 1899). — British Library (IB 23757). References: BMC, 5:501. — ISTC (ih00231500). — MS catalogue (2), no. 371 (with one X beside the title). Caviceo, Jacopo. Dialogue treselegant intitule le Peregrin. 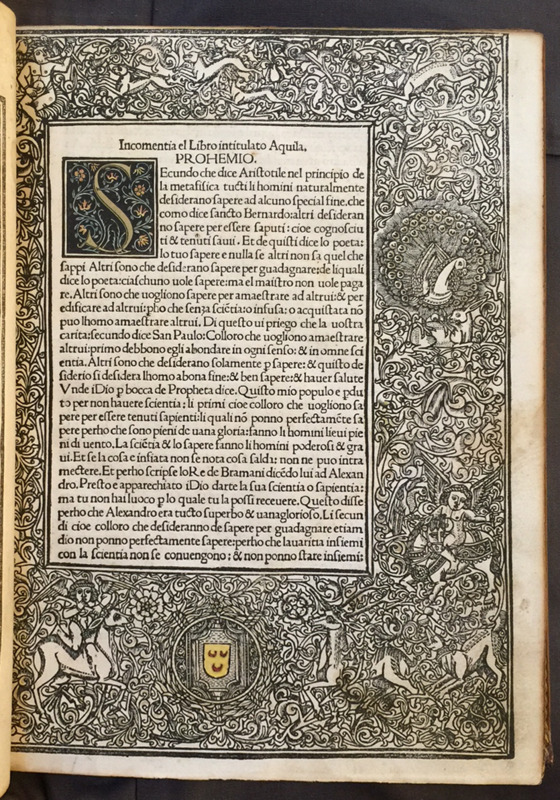 Paris: Galliot du Pre, 1527. Illustrated. With a bibliographical note by Sydney Cockerell. Provenance: Louis Alexandre de Bourbon, Count of Toulouse. — Morris. — Richard Bennett. — Sotheby 1898, lot 346 (sold to Quaritch for £8 10s.). — Bernard Quaritch. — British Library (General Reference Collection C.38.g.6.) [purchased from Quaritch, 1899]. Reference: Ellis valuation, fol. 18b, no. 241 (£3 10s.) 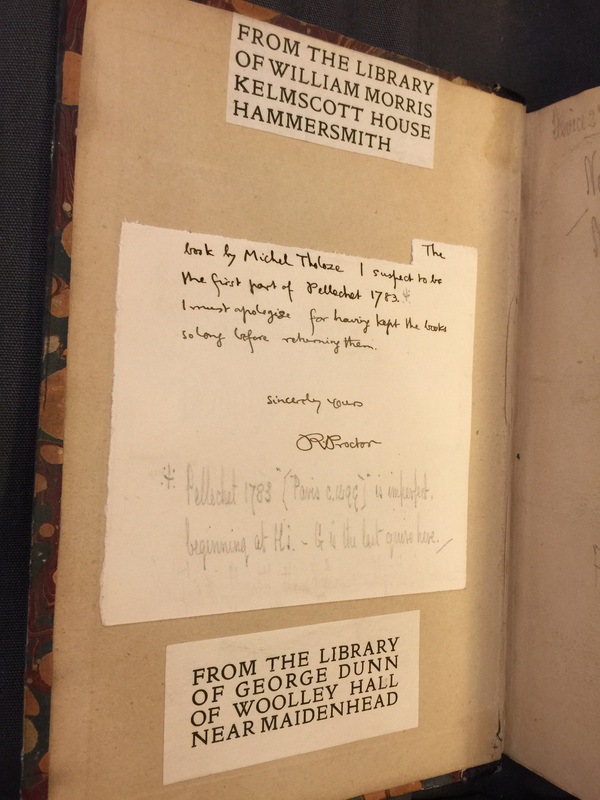 [a marginal note by Sydney Cockerell indicates that Morris paid £6 6s. for it]. Anglicus, Bartholomaeus. De proprietatibus rerum. [Lyon: Nicolaus Philippi and Marcus Reinhart], 10 December 1482. Bibliographical note by Sydney Cockerell tipped in. Provenance: James Atkinson. — Morris. — Richard Bennett. — Sotheby 1898, lot 551 (sold to Quaritch for £6). — Bernard Quaritch. — British Library (IB. 41590) [purchased from Quaritch, May 1899]. References: ISTC (ib00135000). — BMC, 7:246. Brunus Aretinus, Leonardus. Aquila volante. Naples: Ayolfus de Cantono, 27 June 1492. With bibliographical note by Sydney Cockerell laid in. Provenance: Michael Wodhull. — Wodhull sale. — Morris. — Richard Bennett. — Sotheby 1898, lot 133 (sold to Quaritch for £28). — Bernard Quaritch. — British Library (IB.29556) [purchased from Quaritch, May 1899]. References: Ellis valuation, fol. 14b, no. 172 (£5). — ISTC (ib01231000). — BMC, 6:874. Digital version: Biblioteca Casanatense, Rome. Grímur Jónsson Thorkelín. De Danorum rebus gestis secul. III & IV : Poëma danicum dialecto anglo-saxonica. Copenhagen: T. E. Rangel, 1815. The first edition of Beowulf with extensive manuscript annotations by the Rev. John Josias Conybeare. Provenance: J. J. Conybeare. — W. D. Conybeare. — Conybeare sale, Sotheby, 7 December 1857, lot 205 (sold to Boone for 13s.). — Boone. — Morris. — Richard Bennett. — Sotheby 1898, lot 277 (sold to Henry Wellcome for 4s.). — Henry Wellcome. — Whitney Bolton. — British Library (Add. Ms. 71716). Albertus Magnus, Saint. Sermones de tempore et de sanctis. Ulm: Johann Zainer, [not after 1478]. Provenance: Morris. — Richard Bennett. — Sotheby 1898, lot 110 (sold to Leighton for £2 10s.). — British Library (IB.9211). References: BMC, 2:528. — ISTC (ia00331000). Llull, Ramon [Raymundus Lullus]. Arbor scientiae. Barcelona: Pedro Posa, 22 August 1482. Bibliographical note by Sydney Cockerell laid in. Provenance: Morris. — Richard Bennett. — Sotheby 1898, lot 773 (sold to Quaritch for £10). — British Library (IB.52514) [acquired May 1899]. References: Ellis valuation, fol. 38 (£10 10s). — ISTC (il00383000). Dante Alighieri. The comedy of Dante Allighieri. Trans. William Michael Rossetti. London: Macmillan and Co., 1865. Provenance: Morris. — British Library (C.116.b.9). Reference: British Library Database of Bookbindings (with images of binding by Dante Gabriel Rossetti).